Glenbawn Dam is a popular inland sport and recreation destination near Scone, offering year-round attractions for water sports and fishing enthusiasts, nature lovers, bushwalkers, campers and picnickers. The dam has one of the largest rock-fill embankment walls in Australia, 100 metres high and 1.1 kilometres long. The main purpose of the dam is to supply water for irrigation, power generation, stock, industry and household needs in the Hunter Valley, and provide flood mitigation and environmental flows. The wall is 100 metres high and 1,125 metres long. The park has many vantage points with panoramic views of the lake and countryside. Entry to the dam can be purchased through Lake Glenbawn State Park. The office is open 9am to 5pm daily. Phone 02 6543 7193. Glenbawn Dam is 20 kilometres east of Scone in the NSW Hunter Valley. Scone is about 270 kilometres north-west of Sydney via the Pacific and New England highways. A range of powered and non-powered camping options are available on the shores of the lake along with cabins and bungalows run by Reflections Holiday Park - Lake Glenbawn. The large lake offers water sports including skiing, jet skis, sailing, canoeing and swimming. Lake Glenbawn State Park has several boat ramps. Fishing at Lake Glenbawn includes Australian bass, Golden perch (yellow belly), silver perch, Murray cod, catfish, eel and carp. Glenbawn Dam is situated on the Hunter River about 20 kilometres east of Scone in the NSW Hunter Valley. The dam is about 270 kilometres north-west of Sydney. Glenbawn Dam has a capacity of 750,000 megalitres, one and a half times that of Sydney Harbour. It has additional potential capacity of 120,000 megalitres for flood mitigation. Glenbawn Dam is named after a property on which it is built. The dam was built in the 1950s to secure water for agriculture, industry and the surrounding townships, and to mitigate flooding. Vineyards and pastures for dairy farming are the main agricultural industries supported by irrigation. The dam also provides water for nearby power stations and the towns of Scone and Muswellbrook. 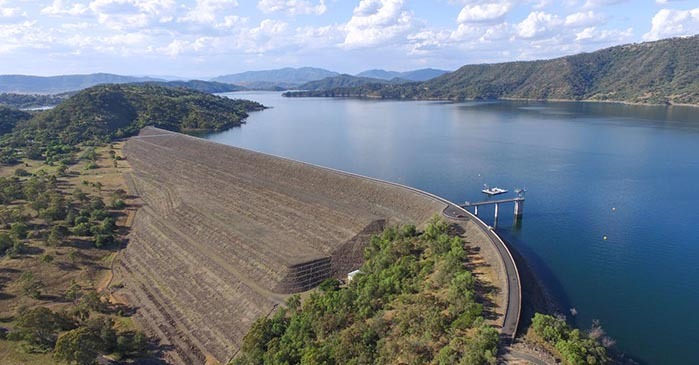 Glenbawn Dam operates in conjunction with Glennies Creek Dam to supply water requirements along 40 kilometres of the Hunter River from Glenbawn to the tidal reaches near Maitland. A six megawatt hydroelectric power station uses irrigation, flood mitigation and environmental flows. Glenbawn Dam is a rock-fill embankment with a clay core. An ungated concrete chute spillway is located about one kilometre south of the dam wall. The original embankment was 78 metres high, providing a storage capacity of 300,000 megalitres. Construction began in 1948 and finished in 1958. The dam was enlarged in 1987. Glenbawn Dam was enlarged in 1987, raising the wall to 100 metres high and increasing storage capacity to 750,000 megalitres with additional potential capacity of 120,000 megalitres for flood mitigation. Trigger - Spillway flows of over 98,000 megalitres per day, last reached in 1995. Notification - Flows of over 98,000 megalitres per day are being passed, levels last reached in 1995. Trigger - When flow increases above 1000 megalitres per day, and when they raise to 4,500 megalitres per day for the first time.